﻿Bryce brings to Peaked Sports a blend of cycling and extensive outdoor experience. A United Bicycle Institute’s Certified Bi﻿cycle Technician, Bryce knows industry standards and will have your bike running like a dream. Actively involved in the mountain bike community Bryce serves as a Board Member for “Mountain Bike the Tetons”. H﻿e’s also a Certified “Level II” Mountain Bike Instructor. When the snow hits the ground Bryce can be found ripping around Grand Targhee’s slopes and skate skiing Teton Valley’s extensive Nordic trail network. 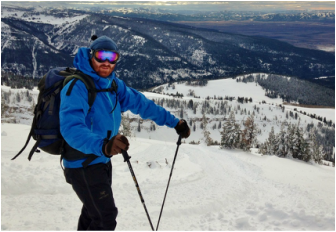 Bryce’s Level 2 Avalanche Certification and local knowledge of the backcountry will have him pointing you towards the “goods” in no time. Find him in the shop tuning skis to perfection. Bryce’s previous work experience includes working as a mountain guide in Wrangell-St. Elias National Park Alaska, and a Wilderness Ranger in Colorado. He knows the West, and its Hot Springs, and is happy to guide you towards your next adventure. Glenn brings to Peaked Sports over 30 years of experience working as a ski technician. 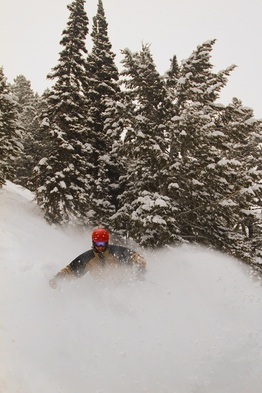 Glenn traded the icy East Coast slopes for Wydaho powder in 2000, where his hunt for the perfect powder turn continues. 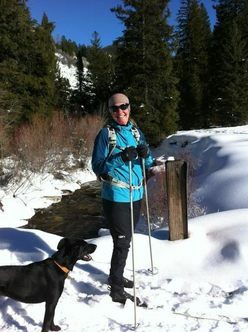 His vast outdoor industry experience and local knowledge will guide you towards the best gear for your needs. When Glenn’s not busy putting that perfect tune on your ski or board, he can be found guiding Cat Ski trips at Grand Targhee or skiing the famous Teton backcountry. Some might find it hard to believe that long time Peaked Sports sales associate and boot fitter , Amanda, was raised in the sunny climes of southern Florida. After high school she and her best friend Gayle decided that snow and sunshine were the next best fit. They found Lak﻿e Tahoe and the Sierras to be the natural move. Amanda, Gayle, and their precious pups Joi, Sunny , and Questa must have needed more powder. In 1998 Amanda (and the rest) made Teton Valley home. Her past experience of snowboarding, skiing, mountain biking, and backpacking brought her here, but days with friends and her dogs hiking the Big Holes and the Tetons, ripping Grand Targhee and the surrounding backcountry make her a true local you can trust. Her extensive product knowledge and passion for the outdoors help inspire all that surround her to smile and have fun. 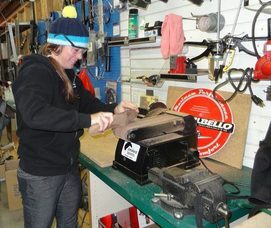 Tricia has 19 years of ski and bike industry retail experience. She has called Killington, VT, Squaw Valley, CA and Brundage, ID her local mountains through the years. She is a Master Boot Fitter having received her certificate through Master Fit University in 2009. Don’t let another season go by with uncomfortable boots, Tricia can find you a perfect fit, build a custom footbed or possibly relieve the pain of your current boots. You will find Tricia mountain biking singletrack in the summer and hunting for powder stashes at her new local mountain Grand Targhee in the winter. ﻿Originally from the Black Hills of South Dakota John has lived in Teton Valley since 2009. An avid cyclist, trail runner and skier John is proud to call Teton Valley and Peaked Sports home. Having worked as a bike mechanic in South Dakota, and a United Bicycle Institute’s Certified Bi﻿cycle Technician, John has a keen interest in cycling's evolving technology and its latest trends. A newbie to trail running, John feels that it is one of the best ways to enjoy the surrounding mountain ranges. Originally from the heart of the Pacific Northwest, Michael joins Peaked for his second year in Teton valley. In the summer months you may find him guiding rafting trip down the Snake River or spending his free time hiking or biking the Tetons. In the shop Michael applies several seasons worth of experience to share with you... Ever heard the term greased lightning? After he touches your skis, you’ll know. During the cold months Michael enjoys a good backcountry powder turn, or just absolutely shredding the Ghee harder than you can even imagine.